This best practice guideline focuses on assisting all nurses providing care to clients requiring infusion therapy in diverse practice settings, both institutional and community. 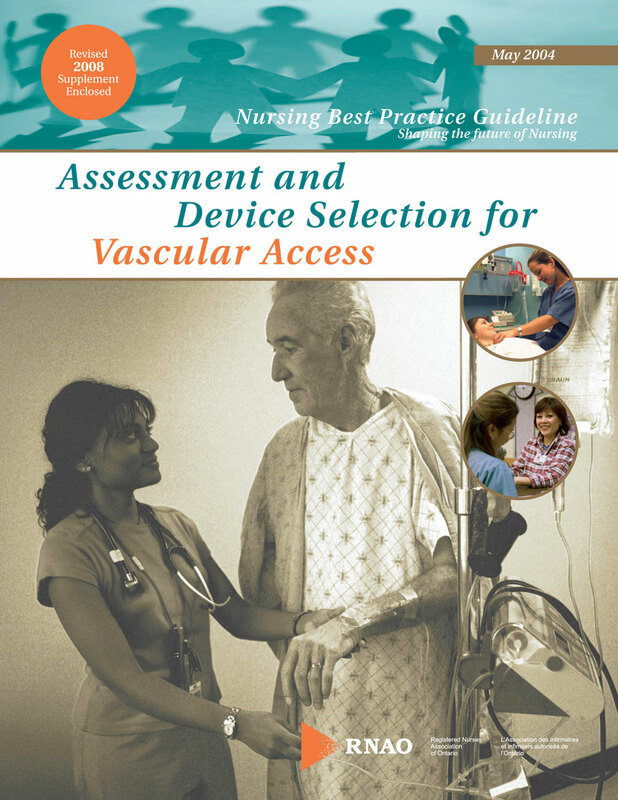 This guideline incorporates best practices related to client assessment and appropriate device selection, which is applicable to all clients requiring vascular access. Nurses working in specialty areas such as paediatrics, gerontology, oncology and dialysis will require further practice direction from guidelines in their unique area of practice. This guideline does not include recommendations related to the care of clients requiring infusion therapy through the following devices: arterial lines; fistulas for emodialysis; pulmonary artery lines; pheresis lines; epidural catheters; pressure monitoring devices; umbilical artery; umbilical vein; and/or intraosseous lines. What should an assessment include prior to the initiation of infusion therapy? What criteria should be used to select/recommend an appropriate vascular access device? How can the risk of complications be minimized through appropriate assessment and device selection?